Very informative, about problems from and for tourists, tips and hazards of beautiful Iceland. Read and take heed. 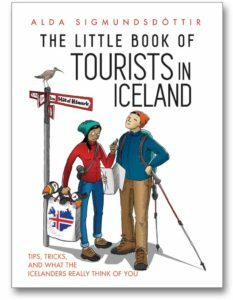 This books holds useful travel information if you plan to visit Iceland; and interesting,amusing stories about the culture and their not long past financial collapse and recovery . Written with just the right amount of humor. It’s a great little book that I was sorry to have end. Highly recommend. Since I may not actually meet any Icelanders when I cruise around it, this book allows me to understand some of the concerns that beseige the country. Hopefully, I’ll be a better guest by having read the book. Concerns for water, toilet paper, erosion, private property, etc. fit right in with my earlier training of Leave No Trace. Highly recommend for quick insight into Iceland’s current concerns.